Yarn Type This is the UK's favourite soft, fleecy yarn that comes in purest white, cream and trendy baby colours. 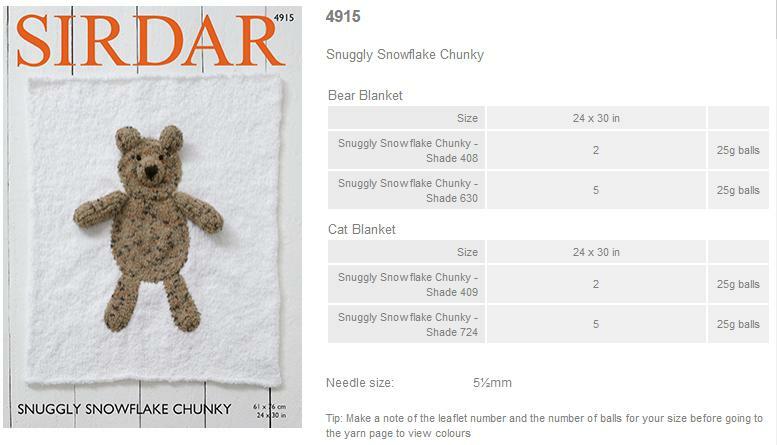 A truly original yarn from Sirdar. 100% Polyester. Leaflet with designs for Bear and Cat Blankets using Snuggly Snowflake Chunky. Leaflet with a design for a Hoodie using Snuggly Snowflake Chunky. 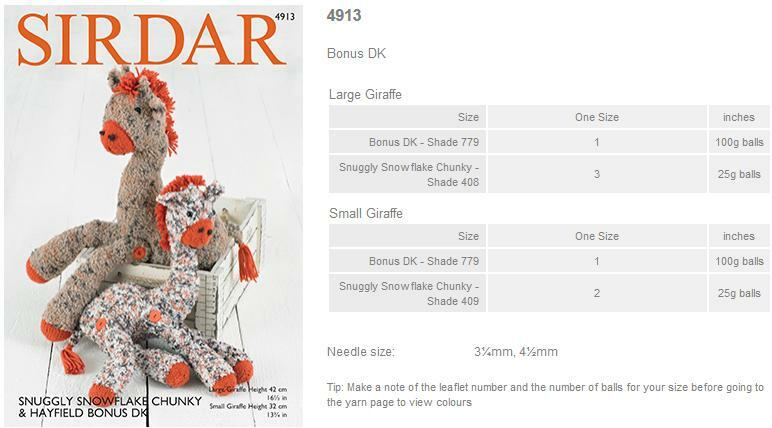 Leaflet with designs for Large and Small Giraffes using Snuggly Snowflake Chunky. 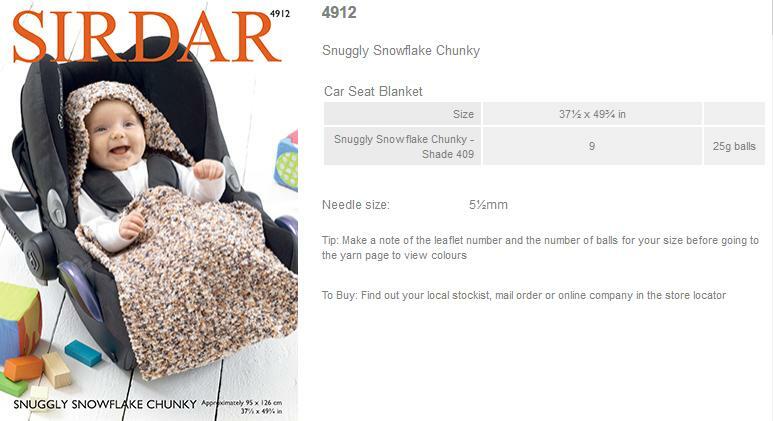 Leaflet with a design for a Car Seat Blanket using Snuggly Snowflake Chunky. Leaflet with designs for a Rabbit hand puppet and Cat hand puppet using Snuggly Snowflake Chunky. Sirdar have discovered Sue Jobsons unique style and are delighted to publish the first book of her original designs. 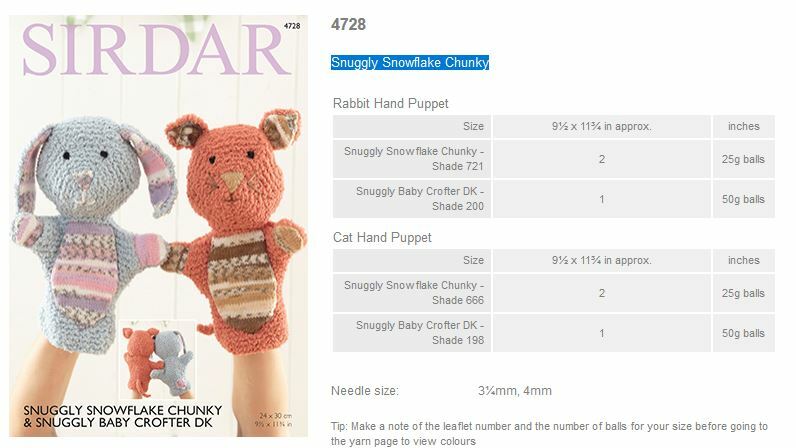 Sirdar Snowflake Chunky is the perfect yarn for making all these toys. For this first book Sue has designed six of the most adorable dogs and eight of the most Moor-ish sheep. There is also George the urban fox, the Paw Print Bag, and the Harry and Mia wardrobes. 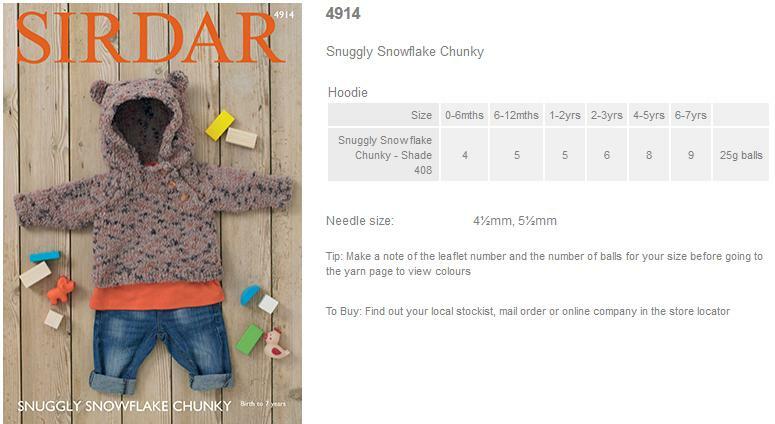 Leaflet with designs for a Jacket using Sirdar Snuggly Snowflake Chunky. Leaflet with designs for an All-In-One, Mittens and Bootees using Sirdar Snuggly Snowflake Chunky. Leaflet with designs for Sweaters, a Hat, Mittens, and Bootees using Sirdar Snuggly Snowflake Chunky. 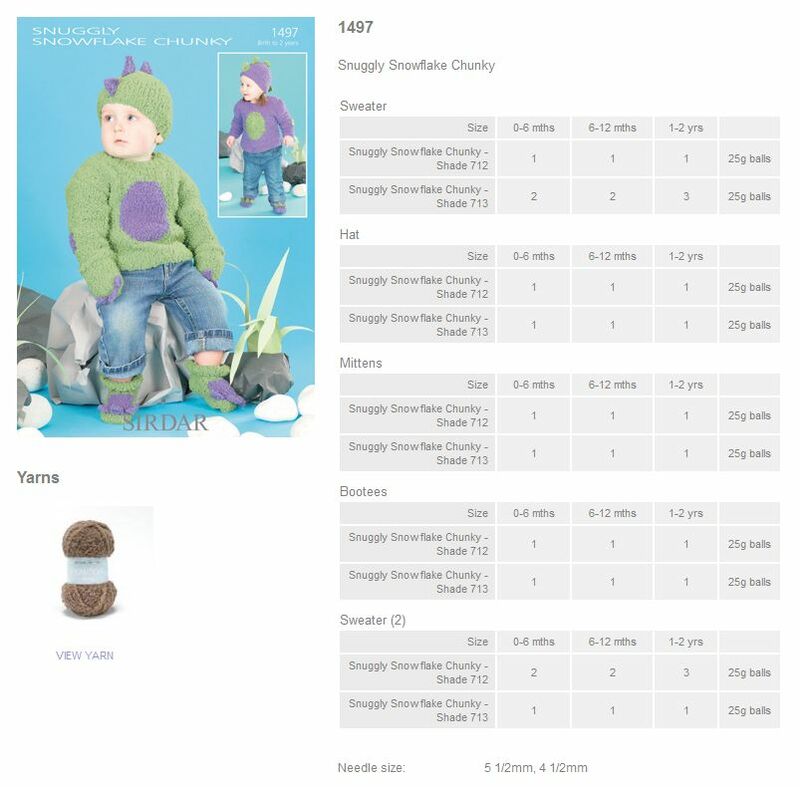 Leaflet with designs for Leroy The Lamb using Sirdar Snuggly Snowflake Chunky. Leaflet with designs for a plain blanket, a blanket with flower, a blanket with frill, and a blanket with squares using Snuggly Snowflake Chunky. Leaflet with designs for a Plain Cardigan, a 2-Colour Cardigan, a Hat, and a Flower using Snuggly Snowflake Chunky. Leaflet with designs for a Sweater, a Pull-On Hat, and a Square Hat using Snuggly Snowflake Chunky. Leaflet with a design for an all-in-one with mittens using Snuggly Snowflake Chunky. Leaflet with designs for Cardigans with Round-Neck, V-Neck, and Collar using Snuggly Snowflake Chunky. Leaflet with a design for a Cardigan with contrasting edges using Snuggly Snowflake Chunky. Leaflet with designs for a short and long-sleeved Bolero using Snuggly Snowflake Chunky. Leaflet with designs for a Bolero with frill borders and a Bolero with rib borders using Snuggly Snowflake Chunky. 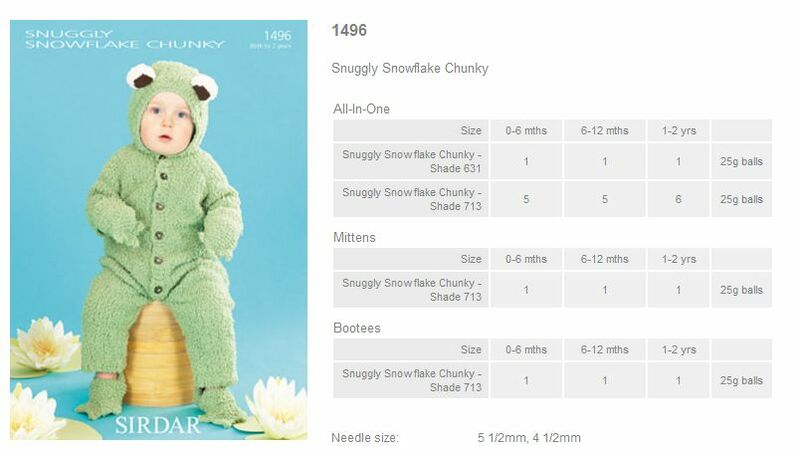 Leaflet with designs for a Hooded Cardigan and Bootees Snuggly Snowflake Chunky. 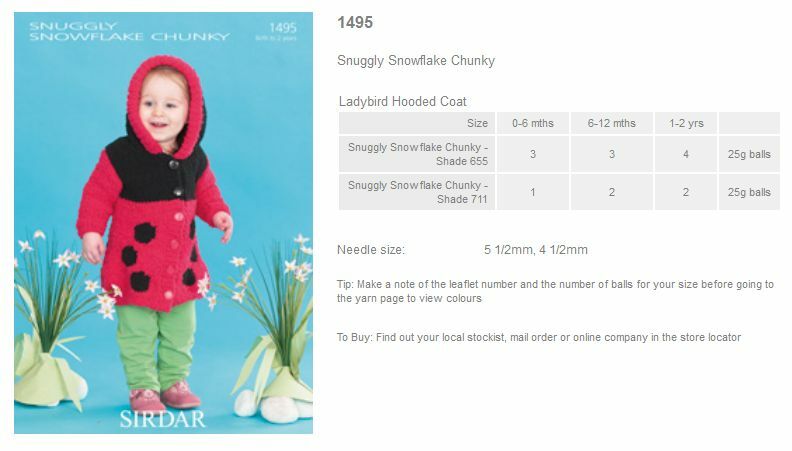 Leaflet with designs for a Bodywarmer with Round Neck and Shawl Collar Snuggly Snowflake Chunky. Leaflet with designs for a Cardigan and Hat Snuggly Snowflake Chunky.